The oneWayDeliveryPolicy is from the Oracle 10g configuration property deliveryPersistencePolicy. 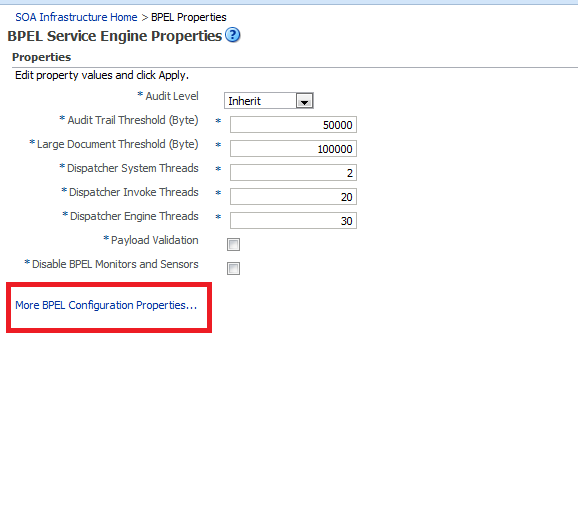 The new configuration property name is bpel.config.oneWayDeliveryPolicy. The oneWayDeliveryPolicy property controls database persistence of messages entering Oracle BPEL Server. By default, incoming requests are saved in the delivery service database tabledlv_message. These requests are later acquired by Oracle BPEL Server worker threads and delivered to the targeted BPEL process. This property persists delivery messages and is applicable to durable processes. When setting the oneWayDeliveryPolicy property to async.cache, if the rate at which one-way messages arrive is much higher than the rate at which Oracle BPEL Server delivers them, or if the server fails, messages may be lost. In addition, the system can become overloaded (messages become backlogged in the scheduled queue) and you may receive out-of-memory errors. Consult your own use case scenarios to determine if this setting is appropriate. One-way invocation messages are stored in the delivery cache until delivered. If the rate at which one-way messages arrive is much higher than the rate at which Oracle BPEL Server delivers them, or if the server fails, messages may be lost. async.persist (Default) Delivery messages are persisted in the database. 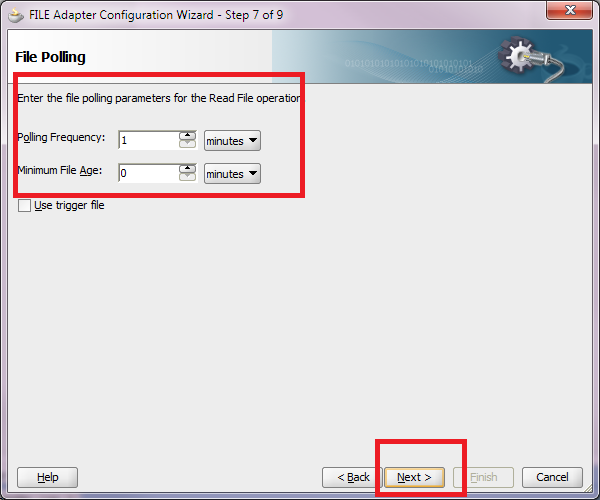 With this setting, reliability is obtained with some performance impact on the database. In some cases, overall system performance can be impacted. async.cache Incoming delivery messages are kept only in the in-memory cache. If performance is preferred over reliability, this setting should be considered. sync Directs Oracle BPEL Server to bypass the scheduling of messages in the invoke queue, and invokes the BPEL instance synchronously. In some cases this setting can improve database performance. This property specifies the number of invoke messages that can be kept in the in-memory cache. Once the engine hits this limit, it would push the message to dispacther in-memory cache, instead it would save the message in the db and these saved messages can be recovered using recovery job. You can use value -1 to disable. The default value is 100000 messages. The StatsLastN property sets the size of the most-recently processed request list. After each request is finished, statistics for the request are kept in a request list. A value less than or equal to 0 disables statistics gathering. To optimize performance, consider disabling statistics collection if you do not need them. This property is applicable to both durable and transient processes. The largedocumentthreshold property sets the large XML document persistence threshold. This is the maximum size (in kilobytes) of a BPEL variable before it is stored in a separate table from the rest of the instance scope data. Large XML documents impact the performance of the entire Oracle BPEL Server if they are constantly read in and written out whenever processing on an instance must be performed. The default value is 10000 (100 kilobytes). The validateXML property validates incoming and outgoing XML documents. 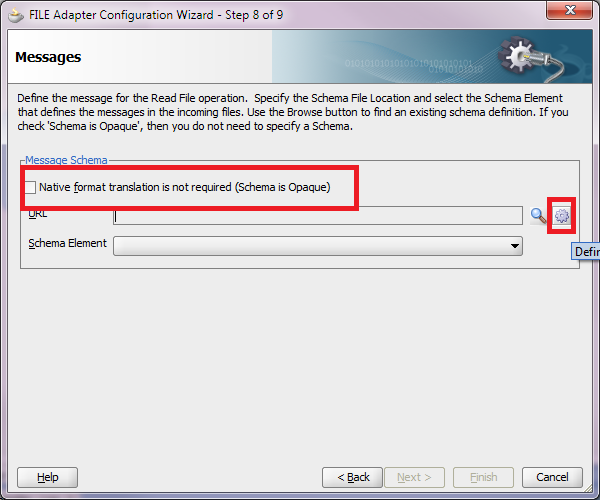 If set to True, the Oracle BPEL Process Manager applies schema validation for incoming and outgoing XML documents. Nonschema-compliant payload data is intercepted and displayed as a fault. CAUTION: Enabling XML payload validation can impact performance. The SyncMaxWaitTime property sets the maximum time the process result receiver waits for a result before returning. Results from asynchronous BPEL processes are retrieved synchronously by a receiver that waits for a result from Oracle BPEL Server. The default value is 45 seconds. The InstanceKeyBlockSize property controls the instance ID range size. 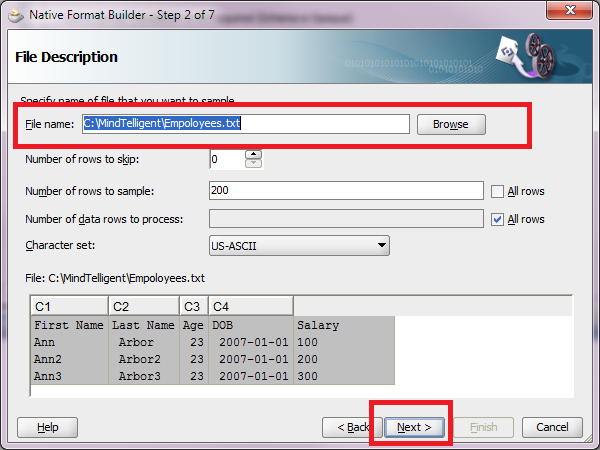 Oracle BPEL Server creates instance keys (a range of process instance IDs) in batches using the value specified. After creating this range of in-memory IDs, the next range is updated and saved in the ci_id_range table. For example, if instanceKeyBlockSize is set to 100, Oracle BPEL Server creates a range of instance keys in-memory (100 keys, which are later inserted into the cube_instance table as cikey). To maintain optimal performance, ensure that the block size is larger than the number of updates to the ci_id_range table. You can configure the number of automatic recovery attempts to submit in the same recoverable instance. The value you provide specifies the maximum number of times invoke and callback messages are recovered. Once the number of recovery attempts on a message exceeds the specified value, a message is marked as nonrecoverable. When a BPEL instance makes a call to another server using invokeMessage, and that call fails due to a server down, validation error, or security exception, the invokeMessage is placed in a recovery queue and BPEL attempts to retry those messages. When there are many messages, and a majority of them are being sent to the same target, the target can become overloaded. Setting the appropriate value of MaxRecoveryAttempt will prevent excessive load on servers that are targeted from BPEL web service calls. The auditLevel property sets the audit trail logging level. This configuration property is applicable to both durable and transient processes. This property controls the amount of audit events that are logged by a process. Audit events result in more database inserts into the audit_trail table which may impact performance. 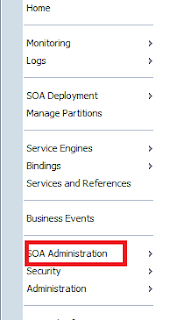 Audit information is used only for viewing the state of the process from Oracle Enterprise Manager Console. Inherit Inherits the audit level from infrastructure level. Off No audit events (activity execution information) are persisted and no logging is performed; this can result in a slight performance boost for processing instances. Minimal All events are logged; however, no audit details (variable content) are logged. Error Logs only serious problems that require immediate attention from the administrator and are not caused by a bug in the product. Using this level can help performance. Production All events are logged. The audit details for assign activities are not logged; the details for all other activities are logged. Development All events are logged; all audit details for all activities are logged. The auditdetailthreshold property sets the maximum size (in kilobytes) of an audit trail details string before it is stored separately from the audit trail. If an audit trail details string is larger than the threshold setting, it is not immediately loaded when the audit trail is initially retrieved; a link is displayed with the size of the details string. Strings larger than the threshold setting are stored in theaudit_details table, instead of the audit_trail table. 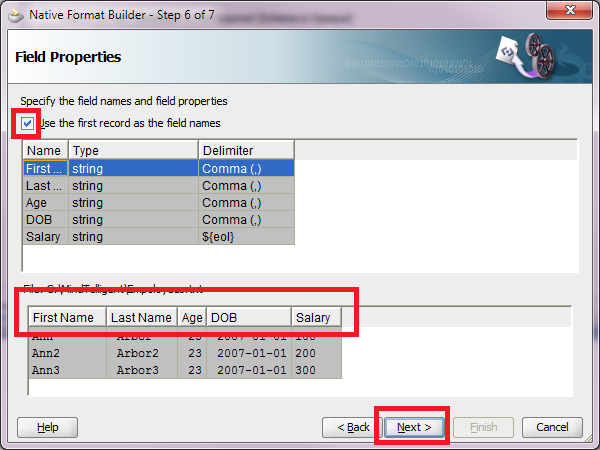 The details string typically contains the contents of a BPEL variable. In cases where the variable is very large, performance can be severely impacted by logging it to the audit trail. The default value is 50000 (50 kilobytes). This property specifies the strategy to persist the BPEL audit data. syncSingleWrite (default) AuditTrail and dehydration are persisted to DB in one transaction. syncMultipleWrite AuditTrail and dehydration are persisted in the same thread but separate transactions. async AuditTrail and dehydration are persisted by separate threads and separate transactions. By default, audit messages are stored as part of the main BPEL transaction. 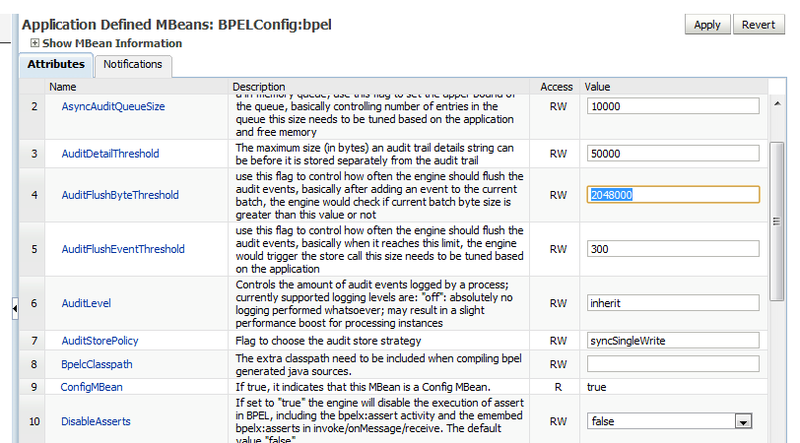 A BPEL instance holds on to the audit messages until the flow reaches dehydration. In some use cases, for example when you have a large loop, and there is no dehydration point in the loop, a large number of audit logs are accumulated. This could lead to an out-of-memory issue and BPEL main transaction can experience timeout errors. You may consider using syncMultipleWrite or async to store the audit message separately from the main transaction. When you use syncMultipleWrite and async auditStorePolicy, there are a few other properties that need to be considered. Please see the sections below. This property controls how often the engine should flush the audit events, basically after adding an event to the current batch, the engine checks to see if the current batch byte size is greater than this value or not. Consider tuning this property when async or syncMultipleWrite audit strageties are used. This size needs to be tuned based on the application. This property controls how often the engine should flush the audit events, basically when it reaches this limit of the number of events, the engine would trigger the store call. When the dispatcher must schedule a dispatch message for execution, it can enqueue the message into a thread pool. Each dispatch set can contain a thread pool (java.util.concurrent.ThreadPoolExecutor). The BPEL thread pool implementation notifies the threads when a message has been enqueued and ensures the appropriate number of threads are instantiated in the pool. The dspSystemThreads property specifies the total number of threads allocated to process system dispatcher messages. System dispatcher messages are general clean-up tasks that are typically processed quickly by the server (for example, releasing stateful message beans back to the pool). Typically, only a small number of threads are required to handle the number of system dispatch messages generated during run time. The minimum number of threads for this thread pool is 1 and it cannot be set to 0 a or negative number. The default value is 2. Any value less than 1 thread is changed to the default. The dspInvokeThreads property specifies the total number of threads allocated to process invocation dispatcher messages. Invocation dispatcher messages are generated for each payload received and are meant to instantiate a new instance. If the majority of requests processed by the engine are instance invocations (as opposed to instance callbacks), greater performance may be achieved by increasing the number of invocation threads. Higher thread counts may cause greater CPU utilization due to higher context switching costs. The default value is 20 threads. Any value less than 1 thread is changed to the default. The dspEngineThreads property specifies the total number of threads allocated to process engine dispatcher messages. Engine dispatcher messages are generated whenever an activity must be processed asynchronously. If the majority of processes deployed are durable with a large number of dehydration points (mid-process receive, onMessage, onAlarm, and wait activities), greater performance may be achieved by increasing the number of engine threads. Note that higher thread counts can cause greater CPU utilization due to higher context switching costs. The default value is 30 threads. Any value less than 1 thread is changed to the default. The dspMaxRequestDepth property sets the maximum number of in-memory activities to process within the same request. 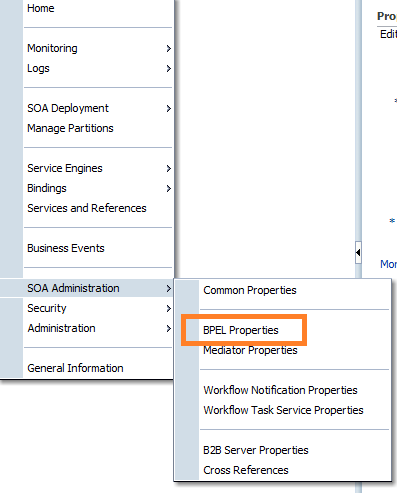 After processing an activity request, Oracle BPEL Process Manager attempts to process as many subsequent activities as possible without jeopardizing the validity of the request. Once the activity processing chain has reached this depth, the instance is dehydrated and the next activity is performed in a separate transaction. If the request depth is too large, the total request time can exceed the application server transaction time out limit.This process is applicable to durable processes. The default value is 600 activities. 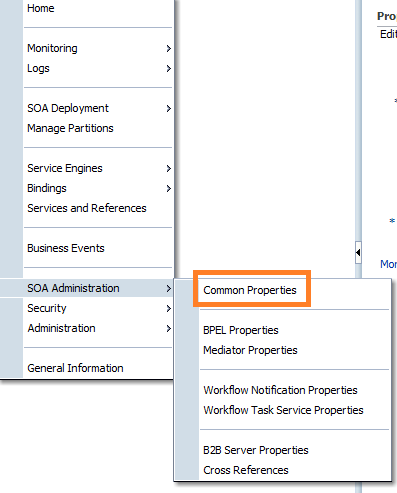 This section lists the config properties of some sections of the deployment descriptor. 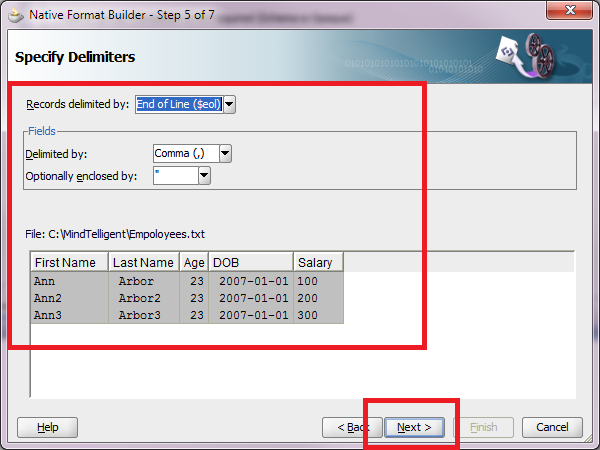 For each configuration property parameter, a description is given, as well as the expected behavior of the engine when it is changed. 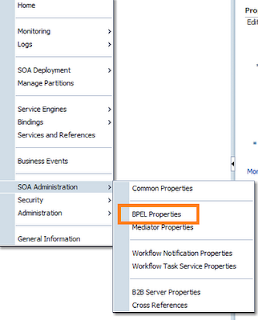 All the properties set in this section affect the behavior of the component containing the BPEL process only. 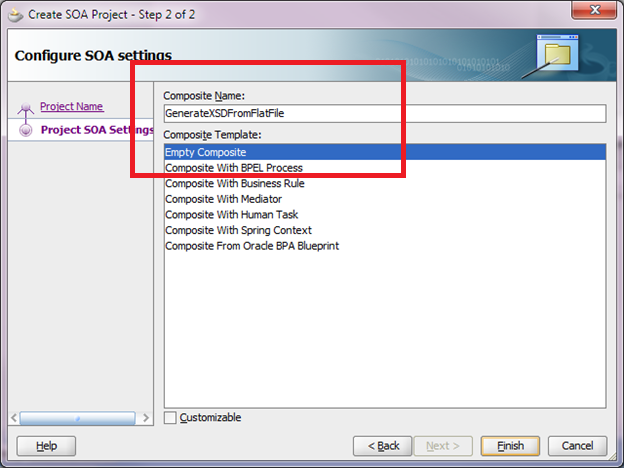 Each BPEL process can be created as a component of a composite. These properties can be modified in composite.xml or in the System MBean Browser of Oracle Enterprise Manager Fusion Middleware Control. This property indicates to Oracle BPEL Server that this process is a transient process and dehydration of the instance is not required. When set to True, the completionPersistPolicy is used to determine persistence behavior. This property can only be set to True for transient processes or processes that do not contain any dehydration points such as receive, wait, onMessage and onAlarm activities. 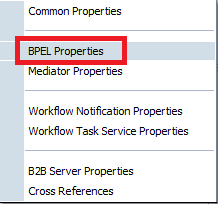 The inMemoryOptimization property is set at the BPEL component level. When set to False, dehydration is disabled which can improve performance in some use cases. False (default): instances are persisted completely and recorded in the dehydration store database. True: The completionPersist policy is used to determine persistence behavior. This property configures how the instance data is saved. It can only be set at the BPEL component level. The completionPersistPolicy property can only be used when inMemoryOptimization is set to be True (transient processes). Note that this parameter may affect database growth and throughput (due to reduced I/O). Deferred The completed instance is saved, but with a different thread and in another transaction. Faulted Only the faulted instances are saved. Note: When an unhandled fault occurs, regardless of these flags, audit information of the instance is persisted within cube_instance table. Off No instances of this process are saved. 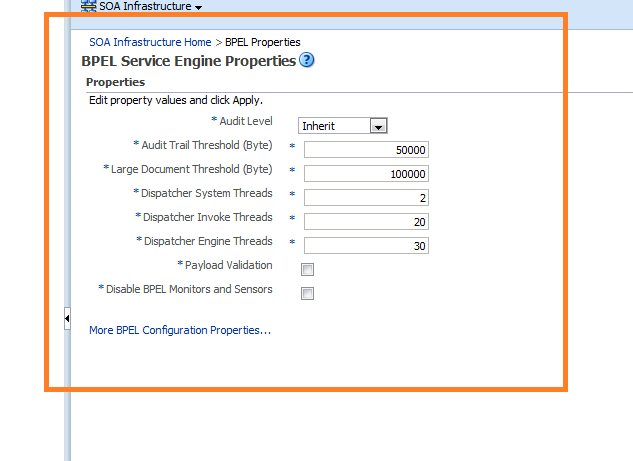 You can set the audit level for a BPEL process service component. 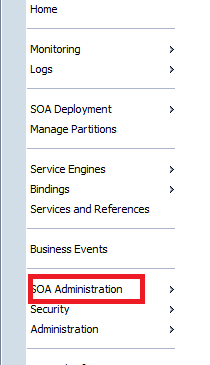 This setting takes precedence over audit level settings at the SOA Infrastructure, service engine, and SOA composite application levels. An idempotent activity is an activity that can be retried (for example, an assign activity or an invoke activity). Oracle BPEL Server saves the instance after a nonidempotent activity. This property is applicable to both durable and transient processes. False: Activity is dehydrated immediately after execution and recorded in the dehydration store. When idempotent is set to False, it provides better failover protection, but may impact performance if the BPEL process accesses the dehydration store frequently. True (default): If Oracle BPEL Server fails, it performs the activity again after restarting. This is because the server does not dehydrate immediately after the invoke and no record exists that the activity executed. Some examples of where this property can be set to True are: read-only services (for example, CreditRatingService) or local EJB/WSIF invocations that share the instance's transaction. A BPEL invoke activity is by default an idempotent activity, meaning that the BPEL process does not dehydrate instances immediately after invoke activities. Therefore, if idempotent is set to true and Oracle BPEL Server fails right after an invoke activity executes, Oracle BPEL Server performs the invoke again after restarting. This is because no record exists that the invoke activity has executed. This property is applicable to both durable and transient processes. If idempotent is set to false, the invoke activity is dehydrated immediately after execution and recorded in the dehydration store. If Oracle BPEL Server then fails and is restarted, the invoke activity is not repeated, because Oracle BPEL Process Manager sees that the invoke already executed. When idempotent is set to false, it provides better failover protection, but at the cost of some performance, since the BPEL process accesses the dehydration store much more frequently. 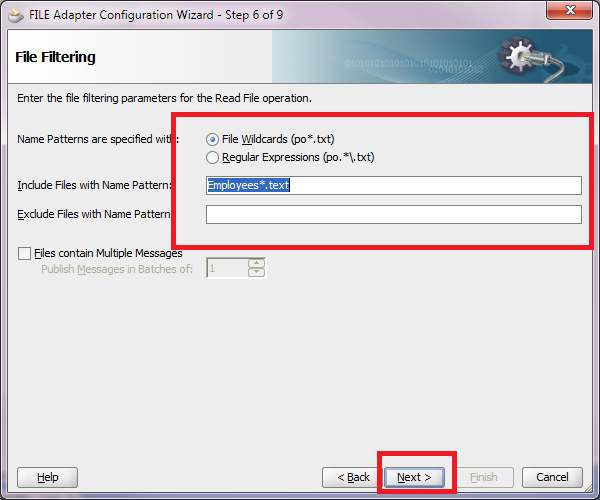 This setting can be configured for each partner link in the bpel.xml file. By default, Oracle BPEL Process Manager executes in a single thread by executing the branches sequentially instead of in parallel. When this property is set to True, the process manager creates a new thread to perform each branch's invoke activity in parallel. This property is applicable to both durable and transient processes. Consider setting this property to True if you have invoke activities in multiple flow or flow n branches. This is especially effective if the parallel invoke activities are two-way, but some benefits can be realized for parallel one-way invokes as well. Invocations to the same partner link will happen in sequence and not in parallel. If you invoke different partner links each time with nonBlockingInvoke set to True, then each link will work in parallel even if all of the partner links point to the same source. True: Oracle BPEL Server spawns a new thread to execute the invocation. False (default): Oracle BPEL Server executes the invoke activity in the single process thread. Enables message boundary validation. Note that additional validation can impact performance by consuming extra CPU and memory resources. True: When set to True the engine validates the XML message against the XML schema during <receive> and <invoke> for this partner link. 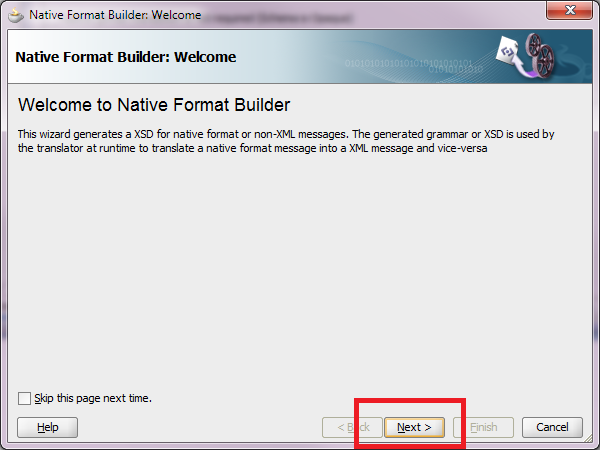 If the XML message is invalid thenbpelx:invalidVariables run time BPEL Fault is thrown. This overrides the domain level validateXML property. False (default): Disables XML validation. 3. Have good logging on your BPEL Process, so that you can see log messages in the diagnostic log files for troubleshooting. 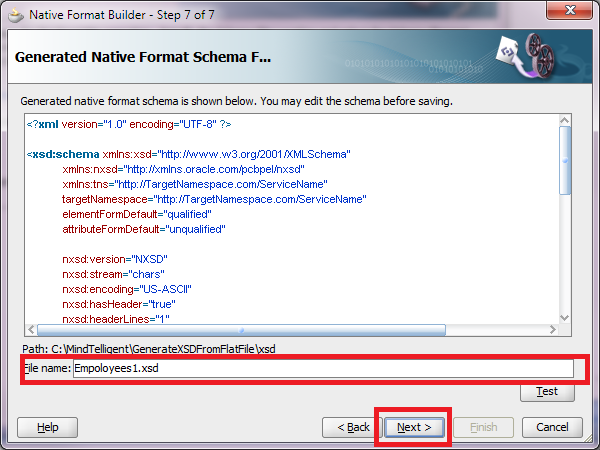 This thread discusses steps to create an XML Schema (XSD) from a sample payload. The payload we are discussing here is a CSV file. The CSV file has header records, and the thread will highlight how the contents of the header records can be used in defining the elements of the generated schema. 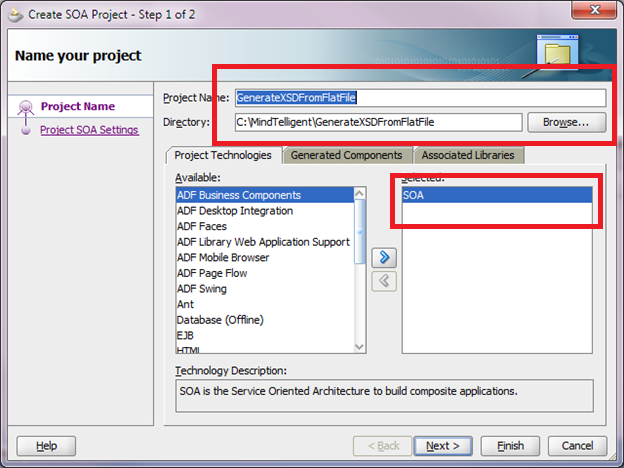 Create a new SOA Project using JDeveloper you may call it GenerateXSDFormFlatFile. as shown below. Choose the Empty Composite option . 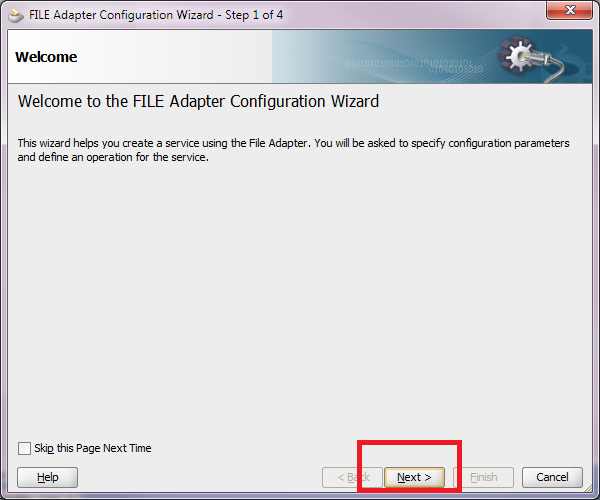 From the resource pallet, choose the File Adapter in the Exposed Services Swim Lane. 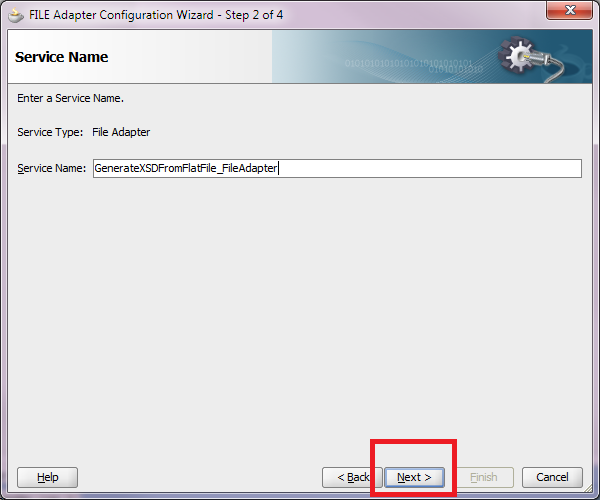 Put the Service Name GenerateXSDFromFlatFile_FileAdapter. 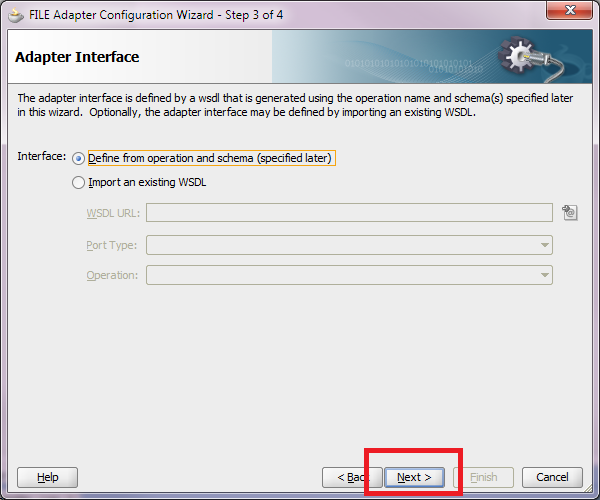 Choose "Define from operation and schema" option. 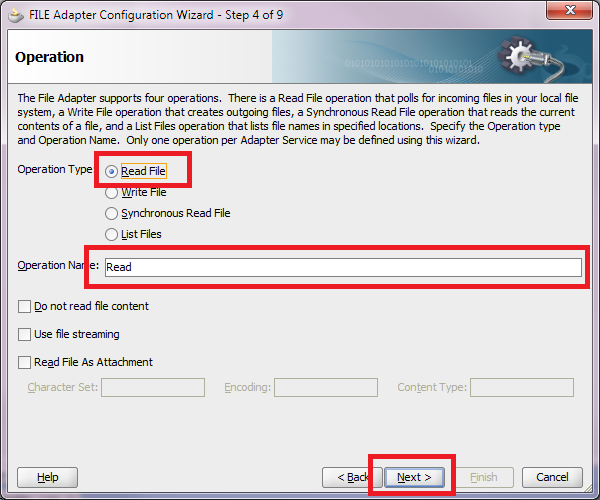 Choose the option to Read File. Choose Operation Name as Read. 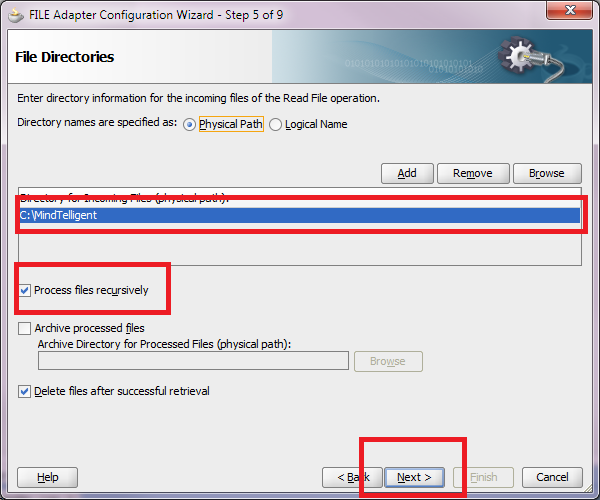 Choose the directory where the file is located. Choose the name of the file. Ensure that the Native Format translation is not required is Unchecked. On the Right Hand Side, click the Icon to Define Native Format. Welcome screen will be displayed. 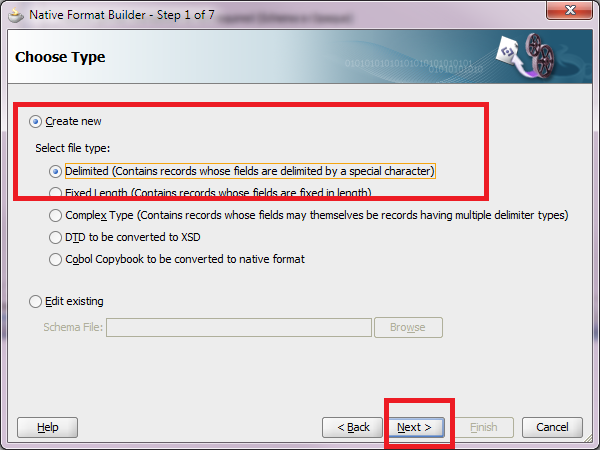 Since our file is comma delimited, choose this Delimited option. Enter a name that will represent the record, Employee in this case. Choose the Delimited By Symbol, Comma(,). Check the Use the first record as the Field Name. 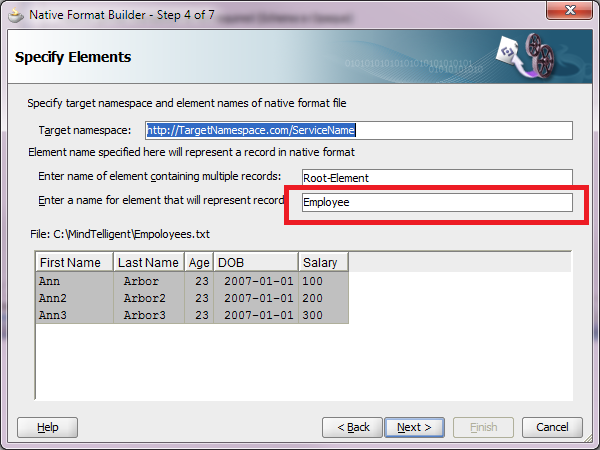 This will ensure that entries in the header record are reflected as the elements of the schema. 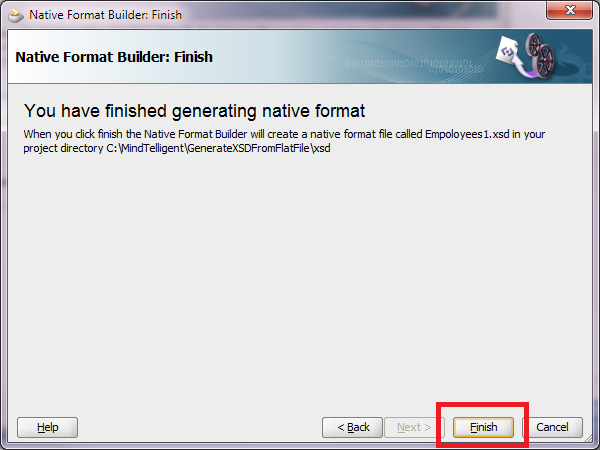 The schema is generated in the xsd folder of the project.